As Millennials set their sights on urban cores like Seattle, homebuilders are faced with interesting new challenges, as this demographic tends to prioritize — and demand — unique communities that are not only energy efficient, sustainable and convenient, but affordable. Through the art of what they call “co-creativity,” Tiscareno Associates | Architecture + Urban Design, and Vibrant Cities have successfully met this unique challenge with their new apartment building, The Cove. In fact, they did so well in creating The Cove, that the community was Certified LEED Platinum and was 100 percent leased within a matter of months after buildout. 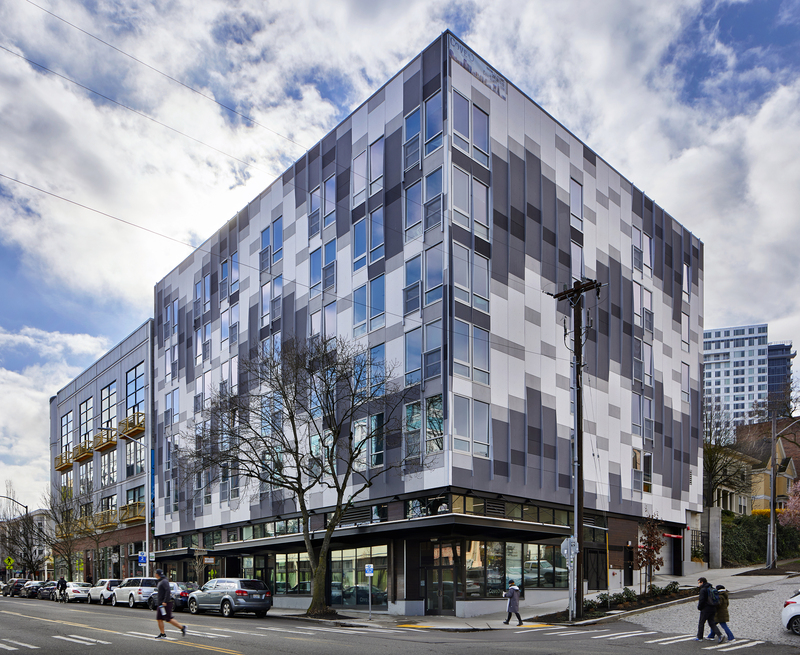 The Cove is a new 60- unit, mixed-use, multifamily development in the heart of Capitol Hill, in the busiest part of Seattle’s Pike-Pine Corridor. This mixed-use building combines retail, restaurant and residential spaces in a way that easily complements the commercial, urban area to its north and the residential neighborhoods to its south. Even more impressively, The Cove fits all of its 50,000 square feet of livable space within a 9,000-square-foot sloped site, while ensuring the development is as energy efficient and sustainable as possible. The Cove earned a LEED Platinum Certification by including as many green features as possible, including green awnings, solar panels, Tilt/Turn windows and more. Vibrant Cities acted as both builder and developer of The Cove, while Tiscareno Associates provided the architectural design. By working together toward a collective goal, these two companies were able to create a community with many unique factors to match its location. Tiscareno Architecture and Vibrant Cities sought to provide housing for those eco-friendly Millennials who live out their values of sustainability. Thanks to their careful, detail-oriented planning, The Cove is so energy efficient and boasts so many green features that it earned the coveted LEED Platinum certification. The Cove’s interiors incorporate several green features, starting with Tilt/Turn floor to ceiling windows that not only promote great energy performance, but look stunning. Other features include ENERGY STAR® Appliances such as efficient toilets, low-flow showerheads and faucets, high-efficiency clothes washers and dishwashers, and LED light fixtures that use onetenth the electricity of a normal bulb while lasting 50 times longer. There are also the highly efficient ductless mini-split AC units in each apartment which are paired with a central heat recovery ventilation system to ensure optimal climate control all year. Apartments can range from 412 to 709 square feet; each one includes a host of green, sustainable features. The Cove is also powered by a 14.3KW solar array that is suspended from the south side of the building, which provides power for all common areas, keeps utility prices reasonable for the retail tenants, and doubles as sunshades. The Cove is also home to a 3,000-square-foot green roof which is watered by high-efficiency irrigation equipment and acts as a stormwater management system. Further, green awnings overhang The Cove’s entrances, providing additional stormwater mitigation and offering glimpses of street-level greenery. The building’s upper levels even utilize sustainable materials like bamboo and pre-finished concrete. This mixed-use development factors in as much space as it can, starting with a high ceilinged lobby, restaurant and retail space, and a unique mezzanine area. The Cove broke ground in 2016 and was completed in October 2017. This multifamily development offers a multitude of floor plans. Studios range from 412 to 430 square feet and are priced from $1725 to $1737. One bedroom, one bathroom units range from 522 to 709 square feet for $1740 and up to $2,926 when a den is included in the floor plan. Two bedroom, two bathroom floor plans are priced from $3,190 to $3,290 per month. As appealing as these units may sound, it may be a little hard to get in. Within days of opening, The Cove was 90 percent leased out, and as it stands, The Cove is 100 percent leased. If that doesn’t boast of a wild success, then what does? With The Cove now gracing Capitol Hill, both Tiscareno Architecure and Vibrant Cities are looking forward to a continued relationship. They are currently designing two more projects together. The first is Pivot, a mixed-use project in the Capitol Hill neighborhood of Seattle offering a smart mix of office, residential, and retail spaces that is in the process of Design Review. The second project is the Alki Condos in the Alki Beach neighborhood of Seattle, which will provide 60 luxury condo units overlooking Elliot Bay. “Both of our firms have a deep desire to create something that is lasting, that actually adds and contributes to the neighborhood that we’re all proud of. The partnership between the two firms is a natural fit,” Robinson concluded. Brianna Fries is an Assistant Editor for Green Home Builder Magazine. She can be reached at brianna@penpubinc.com.